The purpose of this chaplet is to honor the Five Wounds of Our Lord Jesus Christ, and to ask of God the triumph of His holy Church. 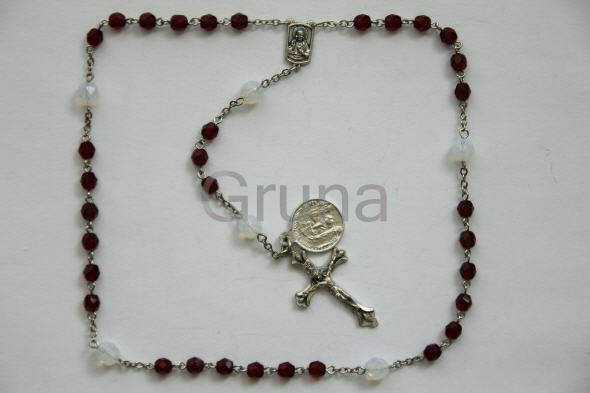 This chaplet is composed of a Cross and 39 beads; of these six are large beads and 33 are small. To this chaplet is attached a medal of the Holy Face. The 33 small beads represent the 33 years of the mortal life of our Divine Lord. The first 30 beads recall to us the 30 years of His hidden life, and are divided into five parts of six beads each, in honor of the senses of touch, hearing, sight, smell, and taste of Jesus, and as they were situated principally in His Holy Face, to render reparative homage for all the sufferings which Our Lord has endured in His Face through each of these senses. be followed by a Glory be to the Father for the same intention. On each large bead pray: My Jesus, mercy! On the small beads pray: Arise, 0 Lord, and let Thy enemies be scattered, and them that hate Thee fly before Thy Face! The Glory be to the Father is recited seven times in honor of the Seven Last Words of Jesus upon the Cross, and Seven Dolors of the Immaculate Virgin. God, our Protector, look down upon us and cast Thine eyes upon the Face of Thy Christ! Zugriffe heute: 2 - gesamt: 2911. Letzte �nderung am Mittwoch, 11. Juni 2014 um 21:30:23 Uhr.